We are either running from our past or fighting to get to our future. In between, there’s nothing. Only blindness and chaos. So what is it about HOMEFREE, playing currently at the Road Theatre on Magnolia, that is really important apart from the obvious? I had to ask myself. In itself HOMEFREE isn’t “complete”. From first-hand experience on one level or another, growing up an inner city kid and dealing with homeless and runaway teens at various times in my life, I see the stories, the personalities, the crisis of character, faith and despair. But there must be something more to a play that bills itself a flip side American dream. There’s got to be more than just crazy, funny and frightening. There’s got to be more than violence. Truthfully, there’s got to be utter vulnerability and the extreme opposite of it. There got to be honesty and deceit – the kind that a child whose perception is abnormally skewed and living on the street, engages in for survival. Because ultimately there is fear. The fear of being desperate, hungry, and un-sheltered, with and almost bipolar craving for security and freedom, the knowledge that there is no where to turn, enemies who are friends, friends who act like enemies, and the most tenacious will to survive it all in the worst way. HOMEFREE touches upon all of these, but only just. Franklin, Breezy and JJ have been kicked out of their homes for being gay, for being pretty and for being nuts. Oh so simple, right? Except when we discover the horrifying, aggressive, hurtful home-lives each one is experiencing prior to meeting up with each other. Breezy’s mom doesn’t want her to come home. Her daughter is pretty enough to unwillingly tempt the man in the house and Breezy is worried her baby sister will fall prey to his sexual advances as well. Franklin is unacceptable to his father as a boy who likes other boys. Especially for a father who is incredibly conservative and mainly concerned with his standing in the community. He’s a smart kid, so he figures out how to get along pretty quick, but some of his techniques are a bitmore dangerous than dumpster diving for food or shoplifting at the mall. JJ, well, he’s emotionally out of control. But it’s pretty obvious that he’s been abused worst of all, deliberately spoon-fed a daily diet of hell by a cruel and violent father. There have been a lot of shows billing themselves as dark, urban, fairy tales of late. Most of them have skated on the lighter side. 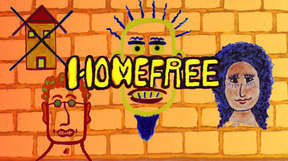 HOMEFREE also loosely steps in and out of the genre playing with caricatures and archetypes. Director Michael Mathews navigates the text fairly well bringing out the sweetness, hilarity and compulsions of each of these kids. Lisa Loomer’s writing however, doesn’t do much more than skim the surface. Fixed in a conservative city in Oregon, (then moving on to an idyllic forest backdrop) may create a romantic point of view of urban grit, but it’s a leap. HOMEFREE’s suburban parks & recreation culture sets the tone in a slightly different manner. The kids’ journey is what is most expressive here, sometimes more than the kids themselves. There is a definite “rabbit-hole” feeling to how they plan and execute their adventure to Los Angeles, more quickly prompted by a sudden violence. And the characters they meet along the way are much more refined and spot on. Ultimately, the actors themselves have the responsibility to bring the depth and feeling to the show. What seems like a lack of knowing what living on the street is really like, is made plain in so many ways that it it’s often hard to go along with it all. There are some gleaming moments though, of occasional character brilliance especially by Gabriela Ortega (Breezy), Cheleas Averill (Shannon) and Donal Russell (Aaron). The actors are age and type cast extremely well and overall step up the energy level of the show at all times. What’s clear, is that HOMEFREE is a tale that needs to be told and more important experienced. In all its weirdness, craziness, occasional jarring effects, and “you gotta wonder” mostly happy ending (although it’s entirely awesome) the reality comes distinctly through. 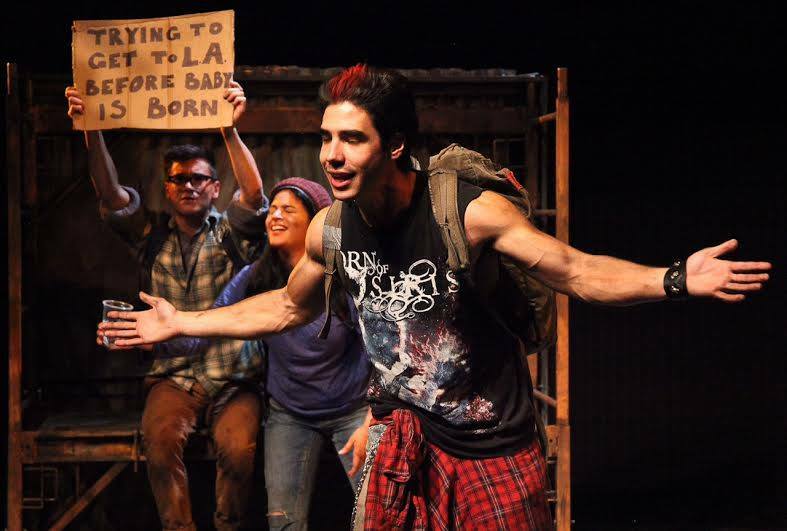 HOMEFREE is an interesting, sweet and fast-moving tale, best relatable to younger audiences who will find an immersive sort of immediacy with the piece. The show really is for them. My only real disappointment is that there were hardly any to be found in the house on the night of my attendance.